Parking is located to the left of the Carriage House where the restaurant is located. Goodstone Inn & Restaurant will cater to all of your needs - big and small. (Advance notice of such requests is required.) In addition, Goodstone offers an impressive Wine Cellar Dining Room featuring an extensive collection of vintages from Virginia and around the world, and the elegant Manor House for intimate, catered events on the estate. 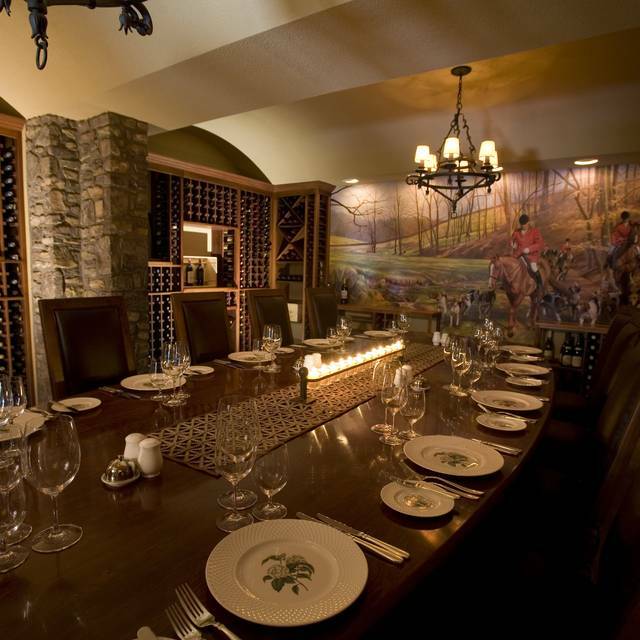 Parties of nine to twelve are invited to take part in a one-of-a-kind experience in our wine cellar. A custom menu with wines paired will be created for your group. The experience will be tailored to your party's particular tastes. 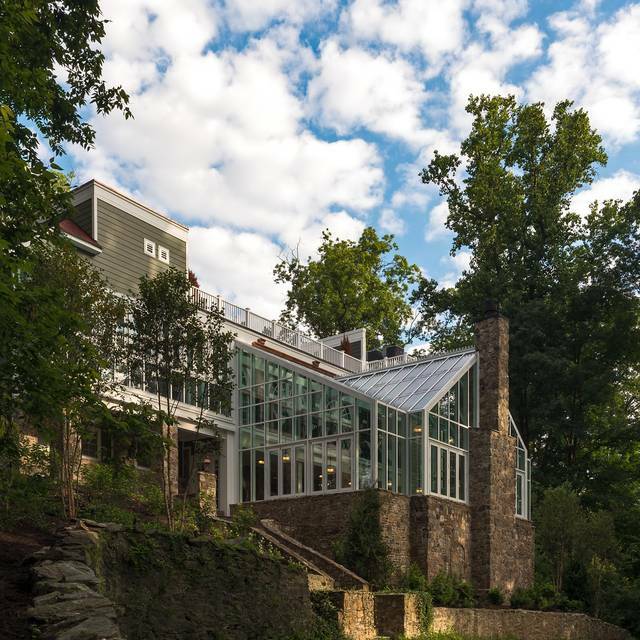 Formerly known as the Goodstone Inn & Restaurant, we now invite you to enjoy a one of a kind culinary experience in what is known as The Conservatory at Goodstone. The Conservatory at Goodstone draws inspiration and purpose from our 265 acres of rolling hills and farmland while providing guests with an unparalleled farm-to-table dining experience. 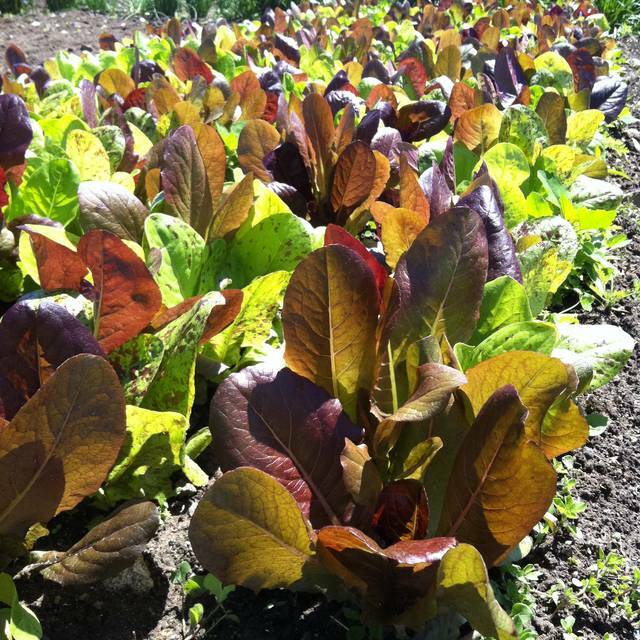 Our award-winning restaurant features the very finest and freshest of ingredients while embracing what the season has to offer from our estate gardens and other local farms. Our award-winning wine cellar offers an extensive selection from Virginia wine country along with vintages from around the world. We sat outside and drank white wine and enjoyed the view of the beautiful grounds, the peace and quiet and the perfect weather. The new Bistro has a Fabulous menu! We had French onion soup which was the best I’ve ever had. Chateaubriand for two tasted delicious and we could cut it with a fork! Everyone took such good care of us as always! We plan to go back very soon! We like fine dining and exploring long winding roads. Add those two things together and discover Goodstone. A great meal in a beautiful setting. Love the Goodstone Inn. Excellent food and service everytime we go. We'd go more often if the price was a tad lower. Still worth it though, enjoyed it thoroughly. It’s hard to put into words the amazing experience we had at the Goodstone Inn! The service is top notch and you immediately feel like you are somewhere special. The food was exquisite and we had the three course meal which came with additional treats like an amuse bouche and some warm bread. The menu changes but we had the lamb and steak for main dishes, salad and tortellini for appetizers and chocolate cookie for dessert. It was absolutely amazing and paced to perfection so that we enjoyed the entire experience from the ambience to the views. More than a restaurant, Goodstone is an experience which is well worth trying!! We dine at Goodstone six or seven times a year, usually for special occasions but sometimes "just because." Since we started eating there three or four years ago, we have never been disappointed, whether we were celebrating Thanksgiving with family or just having a quiet dinner for the two of us. Everything is done perfectly, and frequently the dishes Chef offers reach the heights of ecstasy (if it's on the menu, try the lamb!). Goodstone is blessed with an outstanding bartender, a brilliant somelier (from Morocco by way of Ireland, if you can imagine), and warm, welcoming and knowledgeable staff. And everyone comes with a good sense of humor, important when so many fine dining establishments seems so pretentious and overbearing. Goodstone is true to its roots. We've never stayed at the Inn (we live nearby in Middleburg) but we thinking about treating ourselves to that experience as well. Thank you Goodstone! My wife and I stopped at the Goodstone Restaurant to celebrate our marriage. We had gone to Winchester for a civil union and stopped at the restaurant. We were early for our 530 reservation so we went to the bar for drinks. We had the tasting menu and the food was fantastic. Service was top notch as well. The restaurant and the bar is tastefully appointed. Will definitely come back here again when my in-laws are in town. Drive down a picturesque road, up a long driveway and at the summit you will find this wonderful Inn. The restaurant is housed in a glass conservatory overlooking the countryside. The wine list is extensive, the food exceptional and the staff very friendly and helpful. A must stop during your next trip to Middleburg. Top rate!!! First visit 4 of us enjoyed the chefs tasting experience with wine pairings for 2. I have to say we were extremely impressed. Equal to any dining experience at The Inn at Little Washington. However without the pretense. Setting in the greenhouse with the full moon rise was wonderful. We will certainly be back and will encourage others to visit. Thanks so much!!! Overall excellent. Food was very good, not quite “Excellent”. Temperature at serving was slightly off. Goodstone Inn is a beautiful property in Middleburg! The Spring flowers are just beginning to pop up. 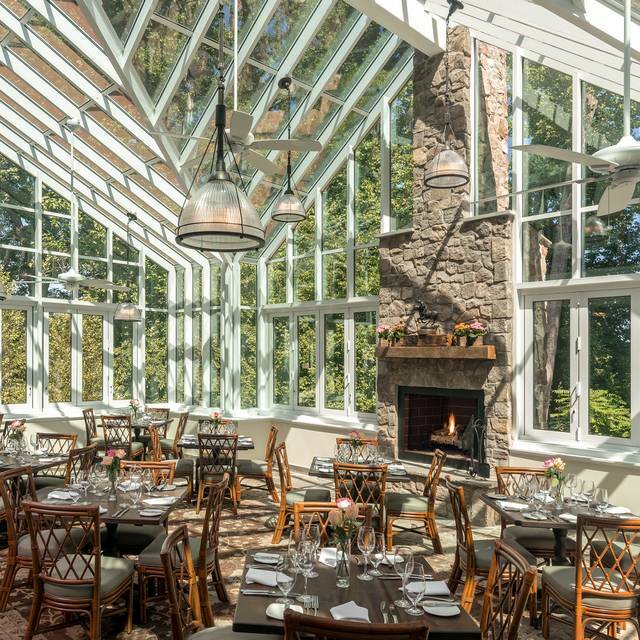 Their main dining room is a Conservatory with fireplace & soaring glass ceiling. We were greeted by Carlos & taken care of by sommelier, Stephen. They always make us feel like family. We relaxed with a Kir Royale & warm baked bread/butter/EVOO. The menu offers 3 courses & we both ordered the same dishes! The Sunchoke soup w/ pistachios & Matcha dust was delicious. The dry-aged, local NY Strip steak with mushrooms was tender & served with peppercorn and butternut squash sauces. I ordered my favorite Austin Hope red wine. We were very happy to see a Belgium dark chocolate dessert! Cappuccino with a rock candy stirrer completed our meal. Needless to say, we are looking forward to our next visit. My first Wow was The greetings and the welcoming smiles met walking in. Love the grounds & the history of this hidden gem. The restaurant for lunch was not a great experience. Being a set menu you would think or expect the quality and taste would be a gastronomic experience. Fantastic restaurant with impeccable service. Fine dining at its best! My wife and I had a wonderful meal at The Goodstone Inn. World class dining experience. Exceptional personal care and attention to detail. 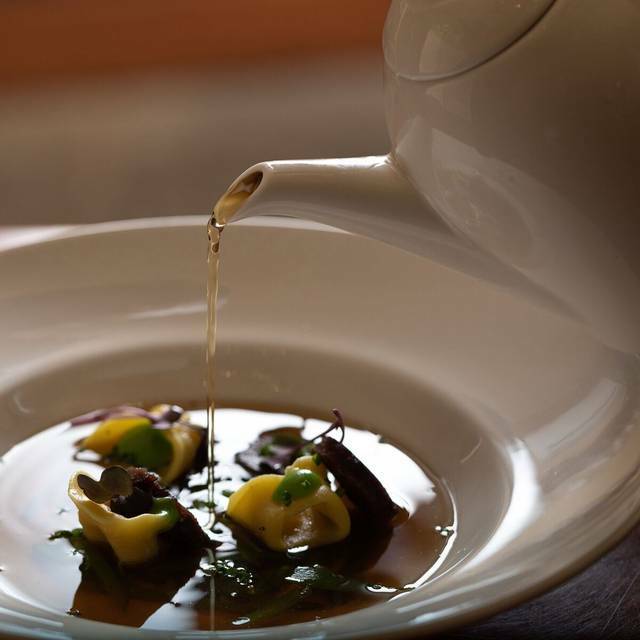 Exceptional chef’s menu; with wine pairing by a world-class sommelier. Joy to visit over and over. Arrive early to enjoy a cocktail at the bar prepared by a highly skilled and creative bartender. Fantastic birthday lunch! Sunchoke Veloute was an incredible discovery- probably the best soup I’ve ever had. The cod was delicious. The Pavlova dessert is just yummy. Thank you for making my birthday extra special. The appetizers and entree’s were great. But the desserts were subpar. We celebrated Valentines Day a couple of days late with our friends in Middleburg at Goodstone Inn. Being there is always a wonderful evening. The entire team is first class and the food was amazing. A special tip of the hat to Betsy and Steven, who again made the whole experience exceptional. Thanks again and we’ll see you soon. This is our second visit to Goodstone and it was a huge disappointment compared to our first visit. We were seated in a corner upstairs on this visit so we could not enjoy the beautiful ambiance of the main floor. The servers made us feel welcome despite feeling like we were tucked into a far off corner. The food was a huge disappointment compared to our first visit. I ordered the lamb which was flavorless, cold and not cooked to my request. My husband offered to trade with me because he could see I was not happy. The beef tenderloin was better but did not meet my expectations for a restaurant of this price and caliber. The sommelier made a wonderful wine selection for our meal so all in all, the service was wonderful, but I wish the food was better. We were so glad that Goodstone re-opened for lunch a few days a week because we've missed this place. 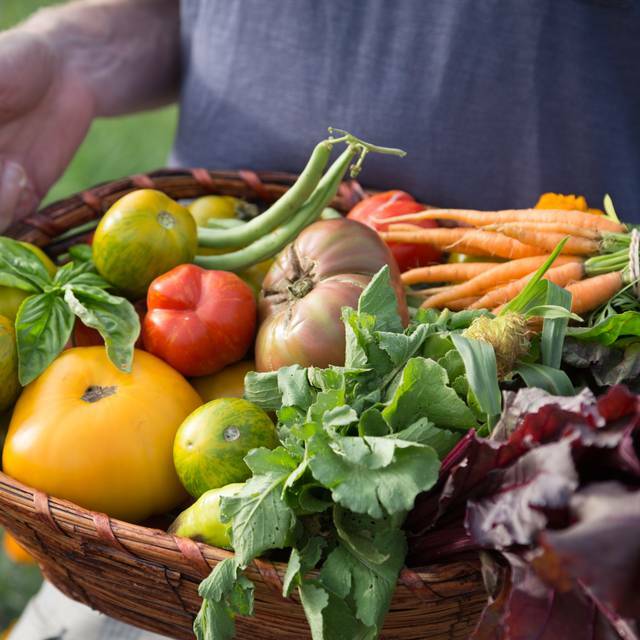 The food is delicious, seasonal, and local, some of it produced on their own property. We don't have big appetites, usually splitting one meal, but were able to finish every bit of the three course prix fixe lunch here. We each got different courses and split each course to get to try more and we both found the entire meal fresh and flavorful. The server was very thoughtful and efficient. Please note, if accessibility is an issue, you can use the path and go in the side door instead of trying to manage the long flight of stairs. Great wine list and great food! Don’t waste your time or money at Salamander - book here! Beautiful bar and a lovely setting! Dinner at the Goodstone is magical. 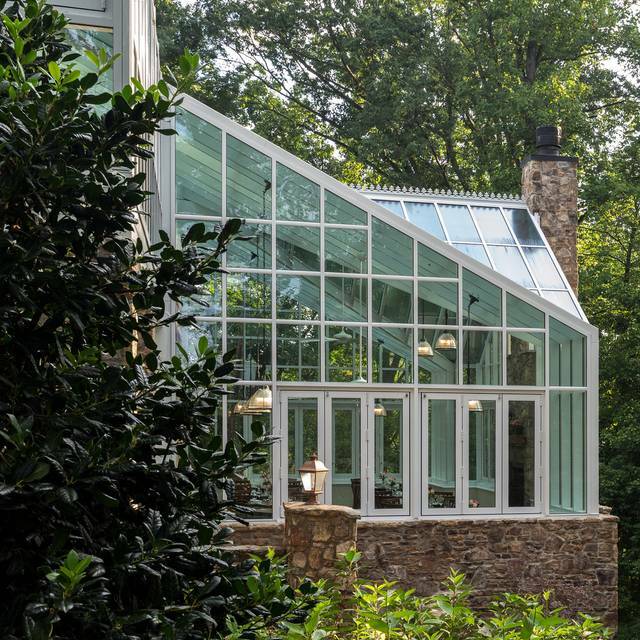 An evening by the wood fire inside Goodstone's all glass conservatory among the trees is itself a remarkable experience not to be missed. Add the unassumingly gracious, professional service and quiet, top quality recorded classical jazz that encourages table conversation even when every table is occupied. On our most recent visit my wife and I enjoyed the new Chef's tasting menu and were impressed by his range of fresh tastes from seafood to lamb and cheese. The wine pairings from Goodstone's award-winning cellar chosen by its gifted sommelier was, as always, especially noteworthy. Reserve early and often! Wonderful brunch in one of the most scenic rural restaurants in which I've ever eaten. Beautiful, remote location on a secluded hill about a mile outside MIddleburg. Glass-walled dining room overlooking the woods and river far below. Excellent, but limited, 3-course brunch menu. Extensive wine list. Overall, well worth the hour-plus drive from DC for a special brunch with family. We brought house guests here for lunch on Saturday. Happy to see familiar faces like Carlos (manager) & Stephen (sommelier). The fire was crackling in the Carriage House as well as the Conservatory. We ordered my new favorite red wine, Austin Hope (from Paso Robles, California). It was decanted expertly by Stephen & enjoyed by all of us. The usual bread was upgraded to a plate of brioche rolls. Appetizers included the Fall salad & carrot soup w/ Matcha powder. Our friends both ordered the Cod entrée, Barry had Chicken & I splurged on the Risotto. All big hits! Desserts were the Pave', Pavlova & a special chocolate treat for Barry. Thanks for that surprise, Chef! We all relaxed over Cappuccinos before Kevin took us on a farm tour to meet Grayson (guard llama), goats, sheep, et al. It was a lovely day in the country. Pricey, but no complaints at all about the quality. Great food and service all the way around. Excellent meal tonight at the Goodstone Inn. Can’t wait to go back! The new atrium and the current chef make this once again our favorite place to dine in the far suburbs. Exquisite, great staff, original refined food, appropriate portions (as in not too big) and a wonderful atmosphere. The new conservatory is stunning. We really enjoyed sitting in front of a fire and gazing out at the surrounding woods and overhead stars. The food was excellent. The service was friendly and attentive. We highly recommend Goodstone Inn. It's a perfect place to celebrate or simply enjoy the good life. Superb! My wife and I went for an early Sunday dinner in January. The drive through the countryside and up the hill set the stage for a great evening. We had been before, but this is the first time since their renovation. What a great combination of historical stone buildings and the new glass atrium. The staff showed us the changes - you can tell they were proud of their place. We both had the tasting menu - five courses, each to be savored. Soup, salad, cod, venison, cheese and dessert. We were wowed by the flavors. As for the service, we were given a lot of attention. When we showed interest in Virginia wines, our waitress brought over a bottle of her favorite, so that we could sample it. It was a flawless experience. Very romantic, with a roaring fire in the fireplace. No cheap, but given the price of other restaurants in the greater DC area, a good value. Looking forward to next time! We celebrated a birthday with family at Goodstone. The food and service were simply outstanding. Chose this restaurant for New Year's Eve (also our anniversary) because of all of the great reviews. Unfortunately our experience was disappointing. We may have had an unusual experience because of the holiday, but they were offering a fixed menu only, and on that menu the only options for the main course were venison and a vegetable dish (it was a multi-course prix fixe meal, but these were the main course options). Neither my husband nor I enjoy venison and while I might have been able to get by with the vegetable dish, my husband, who is generally a meat and potatoes kind of guy but doesn't enjoy game, would definitely NOT have been happy with a vegetarian main course. Even I would have had a difficult time paying $115 per person and having a main course of vegetables. The evening's menu was not posted anywhere online (we looked extensively in advance) or we would have canceled. We both felt it was a really bad call to offer only these two options as a main course. The waitress was wonderful and tried very hard to accommodate us (we are not typically "high maintenance" diners). While initial feedback from the kitchen did not suggest much interest in accommodating, a manager did ultimately arrange for a chicken option so we decided to stay. Quality of the food was pretty good; some things better than others. Service and ambiance were also good. Unfortunately our overall experience was disappointing for what was a special occasion and a relatively expensive meal. Maybe on just a regular night, with more options to choose from, the experience might have been better but I don't think we'll be returning. Last time I was there there was prefixe and a la carte. The website also looked like it had a la carte but there there was only pre fixe option. Another wonderful experience at the Goodstone. Waiter could not explain one dish on the menu, but otherwise it was excellent. Such a lovely experience and they were so accommodating with vegan and vegetarian options. Amazing tasting menu.